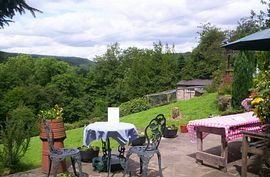 Oakford Cottage is situated in the small hamlet of Robin Hood near Whatstandwell; in the heart of the beautiful Derwent Valley, the cottage enjoys stunning views of the surrounding countryside. There are many interesting walks nearby, especially along the old Cromford Canal, which is designated a site of special interest for wildlife. Ideally situated for excursions to all parts of Derbyshire, especially Matlock, Bakewell, Buxton, Chatsworth and only a few minutes drive from The National Tramway Museum at Crich. 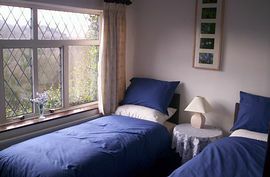 We are a family run B&B giving our guests as interesting and comfortable a stay as possible. 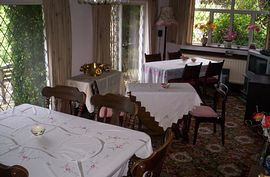 Oakford Cottage is also a Tea Room serving traditional cream teas and refreshments during the day and well known for our cakes, bread and soups, all of which are home cooked. 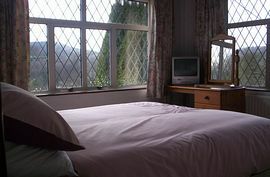 There are three comfortable bedrooms, all with tea/coffee making facilities and TV/DVD player. There is also a residents lounge next to the dining room and terraces outside, to sit and enjoy the views and a cup of tea and a cream scone of course! Flat rate of: £28.00 per person per night, including breakfast. Special Diets Provision: Special diets are catered for. We will always try to cater for any dietry requirements. "Thanks for an excellent short break. Everything was perfect and we were looked after very well. Definitely will stay again." S&E Mansfield "Just what we wanted - a comfortable B&B handy for the (Tramway) museum. We will be back, thank you." J&C Glossop. 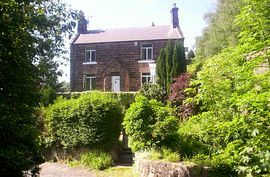 Oakford Cottage is on a small lane, less than a mile from Whatstandwell Railway Station and the main A6 Derby to Matlock road.